You love your home, especially when you are able to customize it to your dream home. Did you know you can make it even more appealing with the right lighting? We’ll look at some of the things that your home’s lighting – inside the house and outside – should do. If you find yourself missing some of these aspects, please give us a call for a free consultation so we can make your house shine! Starting inside your home, the indoor lighting is important, as it is one of the biggest factors in setting the tone and mood of your house. You should have plenty of light in the house, and it might be a good idea to have variable levels of lighting. This means you can have some overhead lighting or track lighting, along with lamps. You need to have easy control over your lighting so you can change the levels of brightness easily. This gives you control over setting the mood. For example, you might want to have a different brightness level for an intimate dinner party than you would when you and the family are around the television watching the game. When it comes to outdoor lighting, you want it to be able to do several things. You want it to illuminate your yard and make it a safe place so you do not trip and fall when walking across the yard! You also need to have lighting that eliminates pools of shadow where burglars and other nefarious individuals might hide. Motion lighting could work well for this. Of course, the lighting needs to do more than keep you safe. The lighting in your yard should make your home look appealing when you have outdoor gatherings that slip into the evening. This is especially true of the backyard or the pool area. Remodeling you home (indoor and outdoor) instantly catches your guest’s eyes, and by having proper lighting installed, they are sure to see every detail. We think that lighting is a very important and functional way to accent your house, and we specialize in knowing where to place the lighting both indoors and outdoors. For those who worry about wasting electricity or spending too much on their energy bill, you can use efficient methods for home lighting. To Live a Green Life has some tips that you might want to consider. They can help you to save a bit on your costs with energy efficient lighting, and you’ll still have high quality lighting that’s visually appealing and safe. 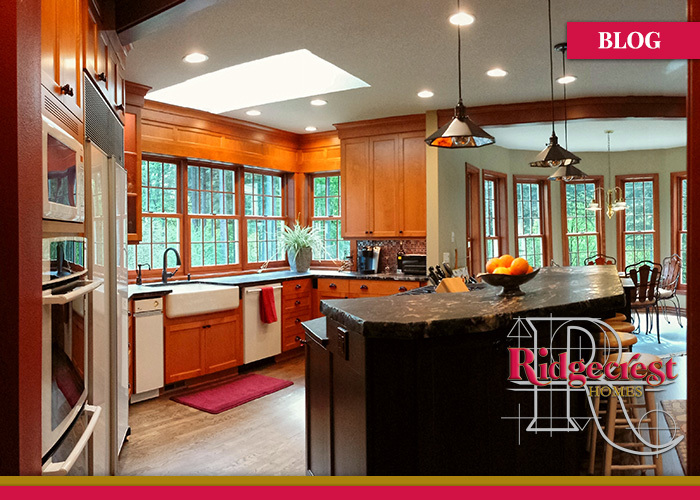 Ridgecrest Homes is a family owned and operated custom home builder and custom remodel contractor serving the Portland Metro area since 1983. Should I Re-Face Existing Cabinets or Replace with New?